Time always seems to be at a premium, doesn’t it? Even with all the effort you put into a business day, there’s always another project waiting for your attention. Likely, one of the biggest time investments you have is prepping customer orders. And, while packing them has become second nature to you, it still takes a while to assemble the container and properly pack the goods within. That’s where investing in entry level automation can help you reclaim some of your day—specifically with the use of tape dispensers. Here’s 5 types that your business will love. This guy’s been around for a while—and he’s stuck around because he’s so useful. Removing the need for scissors, a hand held tape dispenser speeds up the building and sealing of shipping cartons by a considerable amount. Its smart design allows you to mount the carton sealing tape and wrap it around a roller, which helps reduce the chance that you’ll lose the end of the tape. And, its handhold grip makes it easy to carry around, giving you mobility to move between rooms or projects. Perfect for… Moving businesses, assembling boxes, projects that require mobility. Check out… the 2” Hand Held Packing Tape Dispenser, Industrial Grade. Sometimes it’s helpful to have multiple styles of tape on-hand. Masking tape, electrical tape, pressure-sensitive tape, coloured tape—they all have their uses. But corralling that many rolls can pose a challenge, which makes a multi-roll tape dispenser so attractive. Holding several tape rolls on one bar, each can be attached to a cutting blade, making them ready for on-demand use. Its manual operation means there’s no power cord to contend with, so it’s easy to move around if the need arises. Perfect for… Multiple users, multiple tape varieties, small projects that require mobility. Check out… the 3M P56W Multi-Roll Tape Dispenser. Handing the act of cutting tape over to a powered tape dispenser will help you really claim back your time. And having multiple pieces of cut tape waiting on a rotating carousel is ideal when it comes to small or specialty packaging efforts. Wrapping flower stems, bundling wires and cords, taping the necks of small component bags, wrapping gifts, completing crafts—all are made faster and simpler with carousel-style delivery. You’ll maximize taping efforts, whether you’re on your own, or recruiting a team to help you. Perfect for… Specialty packaging, wire harnessing, assembly work, gift wrapping or craft work. Check out… the Automatic Carousel-Style Definite Length Tape Dispenser. Cutting tape by hand not only takes time, it can come with guesswork—just how much tape do you need to cut off? Will you have too much or too little? 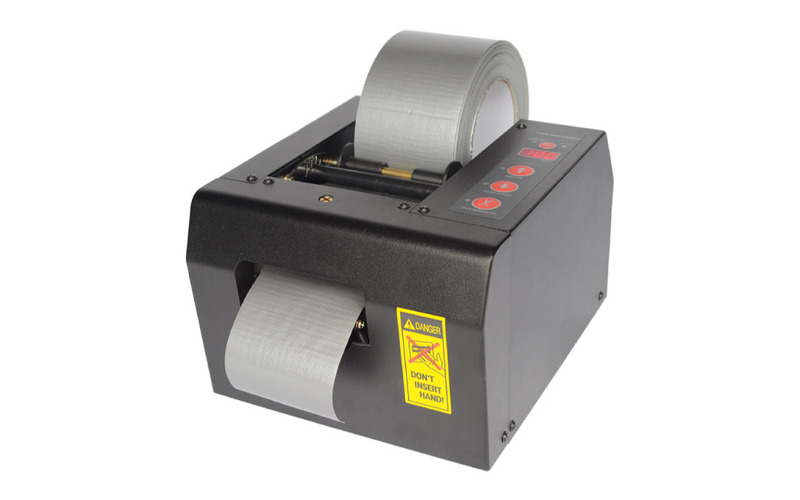 Definite length tape dispensers add measuring features to the powered cutting of tape. With the touch a button, you can ensure the exact length of tape you need is cut and dispensed, reducing waste, saving time and avoiding frustration. Depending on the needs of your packaging strategy, definite length tape dispensers are available in semi-automatic (on-demand use) and automatic (continuous use) options. Perfect for… High-volume or repetitive projects, e-commerce businesses in need of automation. Check out… the Tach-It® 6175 Automatic Definite Length Tape Dispenser. Security is always a concern when it comes to shipping customer orders, which is why kraft packing tape is such a popular option. Using an adhesive that’s activated by water, the tape adheres and melds to a shipping carton, making it impossible to remove without leaving evidence behind. But, that means there’s another step before application. Not only do you have to cut and measure water-activated tape—you must wet it, too. Just like other powered tape dispensers, all it takes is a push of a button to measure, wet and cut the tape. And, if your projects are smaller or if greater mobility is required, manually-operated kraft tape dispensers are available as well. Check out… the Better Pack® 555E Series Electric Kraft Tape Dispenser. As your business grows, it’s important to find ways to not only maintain your processes, but improve them, too. Entry level automation gadgets like tape dispensers can help you and your team shave several seconds off repetitive tasks, which can add up to hours of packing time saved every week. That’s time you can invest in development, marketing, and anything else to grow your business. For all your gadget and packaging needs, The Packaging Company is the place to be.